JACKSON  Republic Group LLC, the "a la carte vendor" that buys all of mayoral candidate Tony Yarber's advertising, told the Jackson Free Press today that the campaign spent $4,400 today on a new television ad to respond to some of the negative video that emerged this past weekend in ads done by the shadowy Citizens for Decency, an unregistered political action committee, or PAC. John Morgan Hughes, the director of political and business development for Hayes Dent Public Strategies, told the JFP that he has purchased all the television advertising for Yarber, including the ads that started running today at 5 p.m. on WAPT and WLBT. Hughes heads the Republic Group, the campaign services subsidiary of Hayes Dent Public Strategies. The three officers listed on the secretary of state's site for Republic Group are Dent, Tony Geiger and Rebekah Echols. Hughes said that Republic Group has placed all of the Yarber campaign advertising unless the campaign placed an ad he didn't know about. "(Unless) they're buying it without my knowledge," he said. He said he would provide a full total of money that the Yarber campaign paid to his firm for advertising and other services to the Jackson Free Press later this evening. The Republic Group also did an early poll in the race that showed Chokwe A. Lumumba and Yarber leading the race, but Hughes said that it was "internal" and that neither the Yarber campaign or supporters paid for the phone-generated poll. "We paid for it," he said. Hughes' bio on the company's website says that the Republic Group "works to create a uniquely integrated action plan for each of its clients that includes; general strategy development, image and brand building, financial solicitation, operational budgeting, creative direction, and the implementation of enterprise media marketing plans." And, it adds, the effort is often successful, even in districts where "pro-business" candidates don't always do well. "The Republic Group boasts a cumulative win average of over .700 and has gained an industry moniker for helping elect pro-business candidates in historically hostile districts as well as protecting valuable incumbents." Hughes emphasized that the Hayes Dent operation has only been on the spending end of the Yarber campaign, and not involved in any fund raising. He emphatically denied that the firm had helped with any PAC effort to raise money on behalf of Yarber—a rumor that prompted the Jackson Free Press to call the firm today. "That's not factual in any way," he said. "… Our capacity has been as an a la carte contributor to the campaign." He said he has no knowledge of any of the PACs in this mayoral election, including the mysterious ENI PAC that the JFP reported on previously. Hughes said that Republic Group follows the practice of all such "middlemen" for political advertising with a media purchasing rebate, or MPR, provided by TV and radio stations for bringing them the ad buy. The purchaser (such as a campaign or a PAC) gives Republic Group a certain amount of money; they take 15 percent off the top; and the rest goes to the TV station for advertising. The TV stations, under FCC rules, must keep a public file in the station containing all information about the transaction. In the Yarber campaign's case, Hughes said the campaign gives them a money order, they take it, break it up and distribute it to the different stations. Hughes emphasized that Hayes Dent Public Affairs is a "bipartisan" group, serving a variety of clients including now-Hinds County Supervisors Darrel McQuirter and Tony Greer, and will soon handle the campaign needs of District 1 Circuit Court Judge Jeff Weill. Neither the principals of the parent firm or of the "a la carte" Republic Group indicate a lot of bipartisanship, however. Dent has a long history as a Mississippi Republican. He served as the chief of staff for former Gov. Kirk Fordice, and he was the Republican nominee for Congress in the 2nd Congressional District in 1993, running against now-Rep. Bennie Thompson, a Democrat who won his first term that year. Coincidentally, Thompson is supporting Lumumba, the opponent of Dent's client, Yarber, in this mayoral election, although the congressman supported Melvin Priester Jr. originally. Dent's previous lobbying firm, also based in Jackson, was called Southern Strategies Group. Another principal at the firm, Steve Browning, worked under both Gov. Haley Barbour and Sen. Trent Lott, and was a primary architect of tort reform in Mississippi. Tony Geiger, an officer of the Republic Group, is a member of the Mississippi Republican Party executive committee. The Yarber response ad is scheduled to run one time in the 5-5:30 p.m., 6-6:30 p.m.,10-10:35 p.m. slots tonight, as well as two times tomorrow. As of his most recently filed campaign report on Friday, April 18, Yarber had $1,871.64 cash on hand. 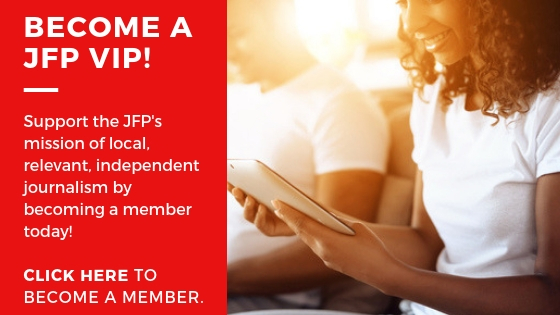 The JFP has not received updated candidate or PAC reports as of press time. Additional reporting by R.L. Nave and Haley Ferretti. Last update tonight and before the polls open: We saw Yarber's ad tonight on WLBT -- boo, hiss on identifying a 13-year-old accused of a crime -- and it was pretty tame. It basically played the "outside agitator" card, with him asking people to join him against "transplanted individuals" trying to "divide us." To be fair, both men have contributions and supporters form outside Jackson and Mississippi. If I had an ounce of energy left, I'd add up the contributions and compare how much money each has collected from outside Jackson and the state. But no go, tonight.